With a digital boost from some Palmetto State scholars, Mark Catesby's botanical collections from the 1720s are continuing to shape what we know, and what we think we know, about South Carolina's native plant communities. 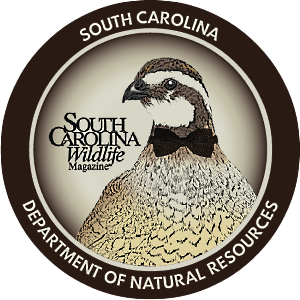 What if we could step back into the wilds of South Carolina as it was 290 years ago? Think of the potential - we could get an idea of what the world was like before widespread European settlement completely changed the nature of our state. All we need is a research partner who could make a careful plant collection in 1723 or so and arrange to have it carefully preserved until the present. Well Patrick McMillan and I have just such a partner. His name is Mark Catesby. We've never met him; we've never even seen a portrait of him. But he assembled one heck of a South Carolina plant collection back in the 1720s. A little background: I've spent the past three years as a graduate student in Plant and Environmental Science at Clemson. Patrick, the director of the South Carolina Botanical Garden and host of the SCETV program Expeditions with Patrick McMillan, is my dissertation director. My husband, Christopher Blackwell, is a professor of classics at Furman University. His research specialty is digital imaging and informatics, which basically means using computers to capture and analyze ancient texts and images of ancient artifacts in ways not possible with traditional paper-and-ink technologies. He says that adding computers to the humanities is like adding telescopes to astronomy: these technologies make our view a million times more powerful. And Mark Catesby? He wrote and illustrated one of the first English-language books describing the natural history of a region of North America. His Natural History of Carolina, Florida and the Bahama Islands was published in pieces between 1729 and 1747. Catesby grew up in England, but spent much of his young adulthood traveling in North America, the Bahamas and Jamaica, exploring South Carolina between 1722 and 1725. Catesby's South Carolina expedition wasn't just for fun. He had wealthy sponsors such as Sir Hans Sloane, president of the Royal Society and College of Physicians, who wanted him to look for plants. The New World was a trove of yet-to-be-discovered treasures - ornamental plants for the horticultural trade, new medicines and plants that no one had seen. 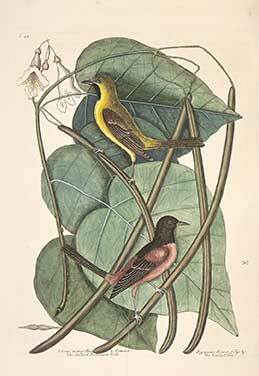 Catesby collected plants with an eye to potential sources of income, but also simply to catalog the world's species. Catesby described many of his new discoveries in the hugely successful Natural History, but the published volume was not his only legacy. As Catesby roamed the forests and hills of "Carolina," he collected specimens, cutting flowers and leaves and drying them flat. He took notes on their habitats and uses, and sent hundreds of these dried specimens back to England. Some went to Sloane, who had them mounted and bound into books. Others went to Oxford University. And there they remain today, hundreds of plant specimens, all in great shape, many just as good as specimens collected only ten years ago. In fact, after all these years, Catesby's specimens are so well preserved that you can still easily see the color pattern on the flowers which separates the Lady Lupine (Lupinus villosus) from Sky Blue Lupine (L. diffusus) - incredible! In November of 2011, Chris, Patrick and I went to the London Natural History Museum to photograph Carolina plants in the historic collections there as part of Chris' ongoing research into digital imaging, supported by federal grants from the National Science Foundation. Working with Mark Spencer, curator of the Sloane Herbarium, we photographed all the Carolina materials we could find - Mark Catesby, John and William Bartram, John Lawson, the so-called Walter Herbarium, and some specimens collected by Robert Ellis and James Oglethorpe. Back at Clemson, Patrick and I worked our way through the images from the two Catesby volumes, identifying all of the vascular plants from the Carolinas. Through the modern miracle that is digital photography, we could access the entire Sloane collection at once and revisit the specimens as often as we liked. The extremely high resolution of the photos allowed us to zoom in on small details as necessary. Later that year, with a fellowship supported by esteemed botanist Wade Batson, I was able to visit the Oxford herbaria, allowing us to also identify the Catesby specimens housed there. In all, we've identified nearly 1,300 vascular plant specimens, all collected in South Carolina and Georgia in the early 1720s. What did we discover? All kinds of things! No one is certain exactly where Catesby traveled - not even Catesby himself. South Carolina had not been well mapped in the 1720s, and there was no GPS. But certain plants grow only in certain places and bloom at certain times. Litsea aestivalis, pondspice, grows next to limesinks and Carolina bays. Hydrangea radiata, snowy hydrangea, grows in the southern Appalachians and blooms in mid-to-late summer. Based on the plants he collected, we concluded that once Catesby left Charleston and Beaufort, he traveled Creek and Cherokee Indian trails through the Savannah River Valley region, perhaps as far north as Clemson. Catesby's journals describe a landscape that is hard to fathom today. Imagine herds of bison and elk, wolves and bears lining the rivers to catch the countless shad and herring that swam upstream to spawn like salmon do in Alaska today. That was the land he explored. The Piedmont he describes was one dominated by vast savannas - enormous grasslands with scattered longleaf pine trees. 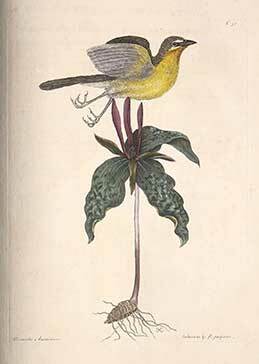 Catesby made a point of collecting the rare and unusual. He collected Fraser's loosestrife (Lysimachia fraseri) more than 120 years before it was "discovered" and officially named. He collected unusual species that only grow on very rare rock types such as Carolina larkspur (Delphinium carolinianum). One of his engravings in the Natural History is quite perplexing. It shows a bison rubbing against a pink flowered locust tree. Most botanists assumed Catesby exaggerated and could not have seen such a tree. After all, the only large pink-flowered locust grows high in the Southern Appalachians. Catesby's Oxford collection contained specimens, and they did indeed turn out to be the tree that should be in the Appalachians! But Catesby remarked that he collected them on a hill overlooking the Savannah River. 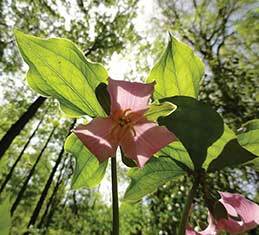 Some 290 years later, Aiken resident Robert McCartney and Patrick McMillan discovered the same species growing in what we now know to be part of its native range in Aiken County! We found specimens of plants that scientists believe were introduced to the Carolinas by Europeans. Some of them definitely were - the European herb catnip and several European grasses appear in the collection, as does a specimen of spiderflower, or cleome, a South American plant that had become a popular ornamental by the time Thomas Jefferson built Monticello. Catesby collected a specimen of indigo somewhere - which wouldn't be that surprising, except that the South Carolina indigo industry didn't take off until 1740. Then there are native plants such as the southern catalpa tree, which scientists have long believed to be native only to the Gulf Coastal Plain. Catesby not only collected several specimens of this tree, he wrote notes about how he had introduced it to the settlers in the area and even sent it to England. Every mention of catalpa in Catesby's notes includes a note on how he found it along the rivers far from settlements, not what we would expect from an introduced plant. 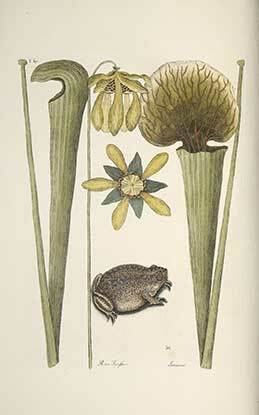 Catesby was personally interested in the practical uses of the plants he found. Aletris aurea, golden colic-root, was used to treat rattlesnake bites. Catesby's handwritten note accompanying a specimen of Smilax auriculata reads, "It's called here China Root and is much in use for Dyet Drinks and is of great esteem for its virtues." Though it's funny to think of Catesby watching his weight, he was referring to the health attributes of smilax, which was, and still is, the source of medicines for various ailments (including, ahem, syphilis) and which became the source of flavoring for the soda fountain drink called sarsaparilla. 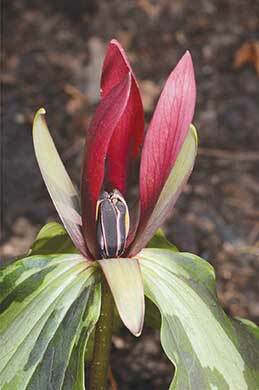 Though most of the plants Catesby collected are still common today, some are nearly gone. The yellow fringeless orchid, Platanthera integra, is now critically imperiled in South Carolina, the victim of land use conversion, habitat fragmentation, fire suppression and collection. Michaux's orchid, Habenaria quinqueseta, hasn't been seen in South Carolina in years. The list of Catesby's plants is a good snapshot of plant biodiversity in this state 300 years ago, before Europeans settled the entire state and converted much of it to agriculture, and Patrick has used this list to design a new natural heritage garden at Clemson's South Carolina Botanical Garden - one that arranges native flora so visitors can walk through a microcosm of our state as it used to be. Biological collections such as herbaria and botanical gardens have huge potential for ecological research. 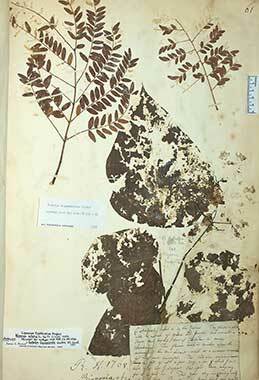 But with traditional methods of herbarium storage, a scholar had to visit a collection in person to examine it. This has long been the case with Catesby's materials, which have been periodically examined by eminent scholars but never published. Our project, Botanica Caroliniana, aims to address this deficiency by making collections available to any user, anywhere, at any time. All of the photographs we took in London are held under a Creative Commons license, which means they are freely available for all non-commercial uses. So far we have concentrated on Catesby's materials, but we intend to continue with Lawson, Bartram and others, adding collections as we can. You can see all of our Catesby images at our Furman University website. (Just do an internet search for Botanica Caroliniana.) There, you'll also find a link to a page we've created that displays Natural History illustrations next to their corresponding specimens. You can also find updates about this ongoing work on our blog, http://botanicacaroliniana.blogspot.com/. As we see it, our work with Catesby isn't "historic botany." It's just botany. We are continuing Catesby's work with plant specimens, using his primary source material, to do scientific work he could not do himself and expanding his discoveries into real-world applications. We like to think he would approve. Amy Hackney Blackwell is a research associate with the South Carolina Botanical Garden at Clemson University.